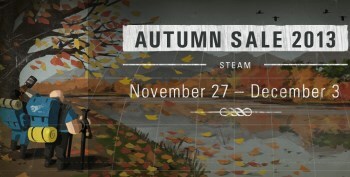 Thanksgiving is almost upon us, and that means it's time to get out your wallets (again) for the 2013 Steam Autumn Sale. The doors have been flung open on the 2013 Steam Autumn Sale, and although all you really need to do at this point is boogie over to Steam and lay down the green (hey, it almost rhymes) I feel obligated to fill some space by pointing out a few seriously solid deals. Let's see here. You got your Daily Deals, like Skyrim for a mere $7.49 or Terraria for $2.49. You got your eight-hour Flash Sales, including Crysis 2 Maximum Edition, also $7.49, or Space Hulk for $10.19. You've got your stupidly stupid-cheap games that maybe you haven't tried yet, like Shadowgrounds for 69 cents, Trine for 99 cents and You Don't Know Jack Vol. 1 XL for $1.01. Got five bucks? Boom, you got Portal 2. Or FTL. Or Fallout: New Vegas. Or whatever. The point is, there's a lot of stuff and it's really cheap, and probably you'll be able to find at least one or two games to throw a few nickels at. And don't worry if you happen to live on the underside of the world, where "autumn" is just a hazy fever dream: You can scroll down to the bottom of the page and take advantage of the 2013 Spring Sale instead. Either way, the deals are good until December 3.